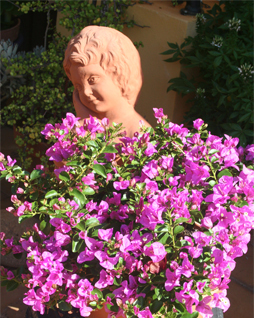 Babybinos are the new world of Bougainvillea Bambino. Babybino Mimi-pur is truly a real dwarf and compact selection of Bambino. These plants are ideal for larger garden pots, they grow to no more than 60cm in height. This makes them ideal for containers or as small shrubs in mixed garden beds. Babybino Mimi-pur bears many purple flower bracts with the usual small white tubular flowers several times a year. These cover the bush. Whilst there are a few small thorns they are few and far between. Homes of today are built on smaller allotments so there is little space for larger spreading plants like the original bougainvillea of yesteryear. Babybino Mimi-pur , because of its dwarf and more compact growth is most suitable to grow in tubs for use on patios, balconies and smaller gardens. The plant does not really spread and climb but stays where planted making it a great plant for the more confined areas which most folk have in their living areas and gardens. It grows 50cm to 60cm high with a similar width. Bambinos are easy care once established. 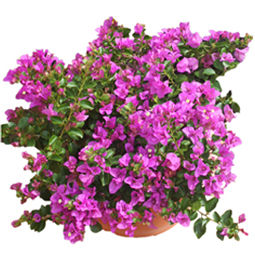 They like high light and will grow in any reasonable garden soil. Pruning after the winter chills have passed together with a fertiliser application of a balanced fertiliser is needed to get good growth response. Babybinos are so well suited to growing in containers that we recommend them for that use. 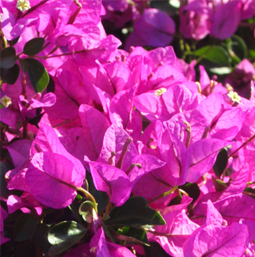 Flowering several times a year the ideal time to shape the bush is by a light pruning after one of the flower bursts is finishing. 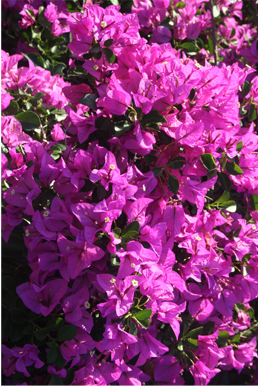 All Bougainvillea from which Bambinos were bred are developed from species which come from Brazil and along the northern coasts of South America. Many hybrids have resulted between the three significant species that breeders have used in their hybridising. Babybino Mimipur was a chance seedling found in the gardens of the breeders, the Iredells of Moggil, Queensland. It was raised from a collection of seed from Bambino’Pedro’. Babybino Mimi-pur comes highly recommended, it is a plant for the smaller gardens of today.